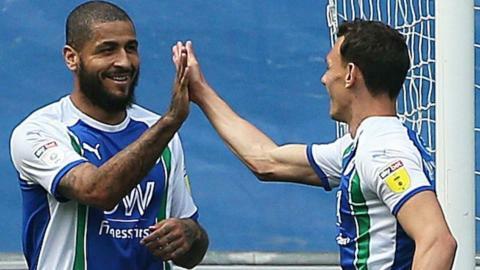 Leon Clarke and Lee Evans secure Championship survival for Wigan and end Preston's faint hopes of making the play-offs. Jordy De Wijs scores a late winner as play-off hopefuls Hull City come from behind to beat struggling Wigan Athletic. Keiran Crompton vowed to walk to Leeds if Wigan Athletic beat Aston Villa by three goals in January. As Swansea City prepare to face Manchester City, midfielder Jay Fulton explains how Wigan toppled Pep Guardiola's team in last season's FA Cup. Purple patches continuing, pink walls vanishing and a pot of gold appearing were among five EFL things you might have missed on Saturday. BBC Sport takes a look at five things you may have missed in the EFL, on a day when one Wigan fan is left to rue a promise. At the halfway point of the Championship season, how is BBC Sport's prediction for the final table looking? An early bath, Sol's first win and a groundsman with a festive feel are among five things you may have missed in Saturday's EFL action. How well do you know the EFL's World Cup stars? The World Cup featured 23 players who are set to start the new season in the English Football League - how well do you know them? Read more on How well do you know the EFL's World Cup stars? Frank Lampard's Derby to go up? Stoke to bounce back to the top flight? Predict your final Championship table. Former Liverpool and England goalkeeper Chris Kirkland tells BBC Sport about his battle with anxiety.